Examples, solutions, videos, worksheets, games, and activities to help Algebra students learn about factoring polynomials by grouping. 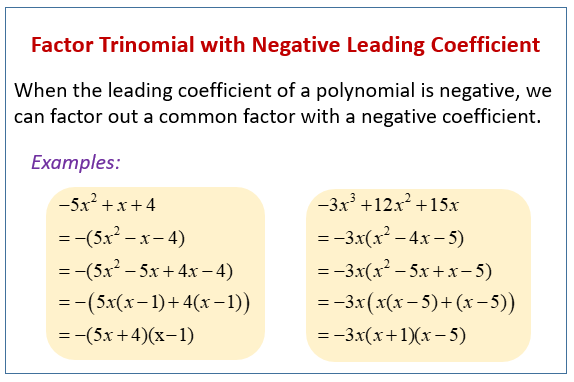 The following diagram shows how to factor a trinomial with a negative leading coefficient using grouping. Scroll down the page for more examples and solutions of factoring trinomials. Why factoring out a negative leading coefficient can be helpful when you need to completely factor a polynomial expression?